A few years ago graffiti and wall paintings were fought with a real “battle against spray cans”, but now things have changed and street art has gained a great artistic value: cities become coloured and they turn into open-air urban museums. Street art and graffiti were born as an artistic expression for social protests and rebellion, and they later became an appreciated form of art, conquering the walls of the whole world, including those of Milan. 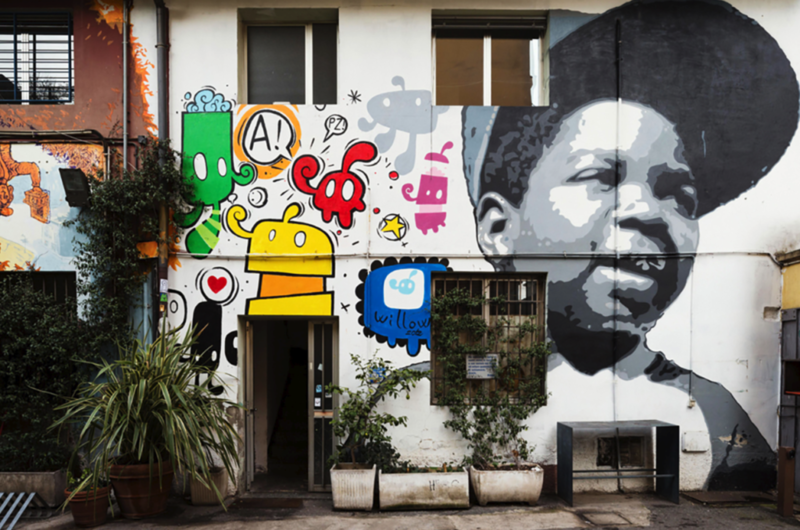 Today we want to accompany you in a tour of the street art in Milan, showing you the places where you can find some of the best urban artworks of our city. You’re about to have a taste of an alternative and coloured Milan: let’s start! Let’s begin from the young Isola district, surrounded by industrial buildings and railway tracks. This district has been recently modernized, becoming one of the coolest areas of the city. Here you can appreciate the works of famous street artists, such as Pao, who transforms common objects – such as electrical hubs – in urban characters, or Mr. Blob, who, with his wall paintings, honours his city ,Taranto, denouncing the problems caused by Ilva. The street art colours also the clubs of the district: it’s the case of Frida Bar, that on its exterior shows several wall paintings. In the picture above, the painting by Zibe with his Arnold, and the painting by Willow, with his coloured characters. The Giardino delle Culture, in Porta Vittoria district, is a 1.250 square meters area that, after a long period of abandon, has been redeveloped and given to the city as a public space aimed at promoting cultural and entertainment activities. Here, the wall of Milo, famous and international street artist, dominates the space. The wall paintings portray huge characters in black and white, surrounded by a tangled city network and two big red hearts. In Porta Genova/Navigli district it’s easy to bump into the numerous wall paintings that colours the area. Starting from Via Vigevano you will encounter Elicriso, an historical social centre that today has become a market of biological products: its exteriors are full of walls paintings that are worth a photo. You will find wall paintings also along the Darsena, until you will arrive at Corso di Porta Ticinese, where you will admire the amazing historical reconstruction of “Milan Street Hi-story”: the wall painting retraces two millennia of Milanese history, portraying famous people and salient moments of the story of our city. On the occasion of its first 170 years, the chimney stack of Distilleria Branca, in via Broletto, was decorated with a coloured wall painting made by Orticanoodles. The chimney stack, that is 55 metres tall, has reached the record of tallest wall painting in Europe. In addition, we suggest you the MAUA – Museo di Arte Urbana Aumentata – , a diffused and open air street art gallery, out of the centre of Milan, which counts 50 works. The wall paintings can be seen using an augmented reality app, thanks to the digital contents that animate the works. MAUA is promoted by the project “Milano città aumentata” (Milano augmented city), one of the 14 winners of the contest “Bando alle periferie” promoted by the Municipality of Milan to rethink and give value to the suburban districts of the city. Of course this is just a selection of street art works in Milan. You just have to discover them in the city!